The SwimFast Ergometer – is an “Ergometer” based swim and exercise station – not simply a rope and bungee system, but rather an air-braked flywheel providing variable levels of resistance mirroring real water action, catch and feel. 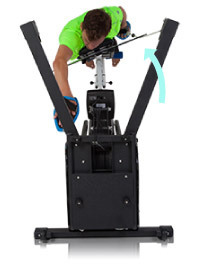 A whole range of strokes can be performed on the SwimFast Ergometer. In addition to swim stroke specific movements. 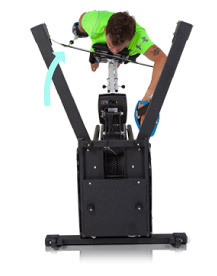 SwimFast Ergometer can also be considered a ballistic exercise station – allowing a whole range of alternate strengthening movements and exercises. Can be used in Higher humidity environments, as it is made from stainless steel and with tropicalized Console. * Adjustable width and length arms to accommodate all different width specific strokes. Return to base tensioned rotational bench. Adjustable length double leg support. E-Z adjust Extendable length bench. Folding compactable and storable design. Learn more about the SwimFast’s unique features here. Upgrade features include: Halo Swim Trainer Template, Full Hand Paddle Grips and Variable Gears. * Whilst the SwimFast Pro Ergometer is designed to better withstand higher humidity environments – please note it is never ideal to store and use mechanical and electronic products in these types of environments. Many pools' environs can be acidic, and corrosive. We therefore offer no firm assurance that some degree of deterioration / oxidation may be a possibility. We would recommend that our products are stored - wherever possible - in friendlier less aggressive environments to avoid premature deterioration.